Still using paper to manage your patients' information? Make the switch to our EMR system and achieve organizational zen. Keep all your charts, patient information, images and even files in one place. Easily find what you need, when you need it. 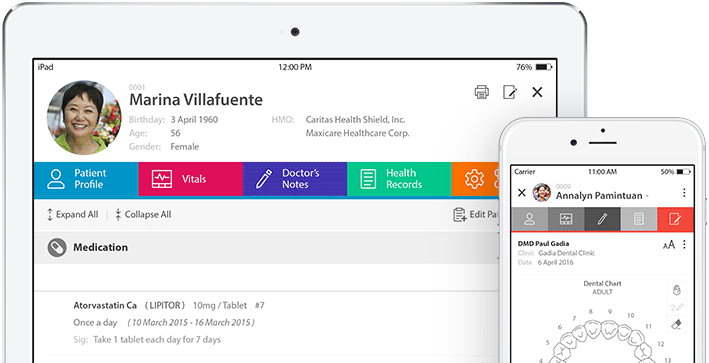 Easily keep track of your patients, track their vitals over time, manage their lab results and more. You can even set up patient profiles to show what you only need to see. No more lost lab results. It's all organized in one place for each of your patients. If you think it's useful now, just wait until you see how it works with the Patient app. Our doctors love the freedom they have when it comes to taking appointment notes. From snapping pictures to freehand drawing (plus Apple Pencil support) and even creating prescriptions. Whatever way you want, however you want to do it, it's here. Sick of using EHR Software that's outdated? Ever lost your data because your PC got fried and can't even contact your developer? Never lose your data again thanks to 24/7 backups through secure, fully encrypted channels. We've put a ton of tech and priority on your security and your peace of mind. Stop Writing. Just Print Wirelessly. SeriousMD Doctors is AirPrint compatible. Print out lab requests, prescriptions, medical certificates and more. The only time you really need to write? It's when you have to sign something you printed out! I commend everybody that made this app happen. I am really happy about what you guys are doing for the medical community. I'm excited to be part of this and if i can help with anything regarding making this even better, just let me know. Thank you, the application is a big help. Especially in my practice in the province, I get to have my patient records with me all the time even when I'm travelling back and forth the city and the province. I get to entertain referrals and questions from past patients regarding their cases. When we said that you'd be in control of your practice when you use SeriousMD Doctors, we meant it. You can customize patient profiles to only show you what you need. You can customize vitals that you need checked. You can take notes however you want. You can use the device that suits how you work. You are in full control. This is the EMR software that you've been waiting for.